Exciting news! The Color Scheme Game was first introduced on this blog many years ago. At the time, I was only teaching live workshops, not having the software flexibility I wanted to teach it properly online. To my delight, the benefits of playing the game have been shared around the world and I find myself teaching live workshops in Wales as well as in the USA. 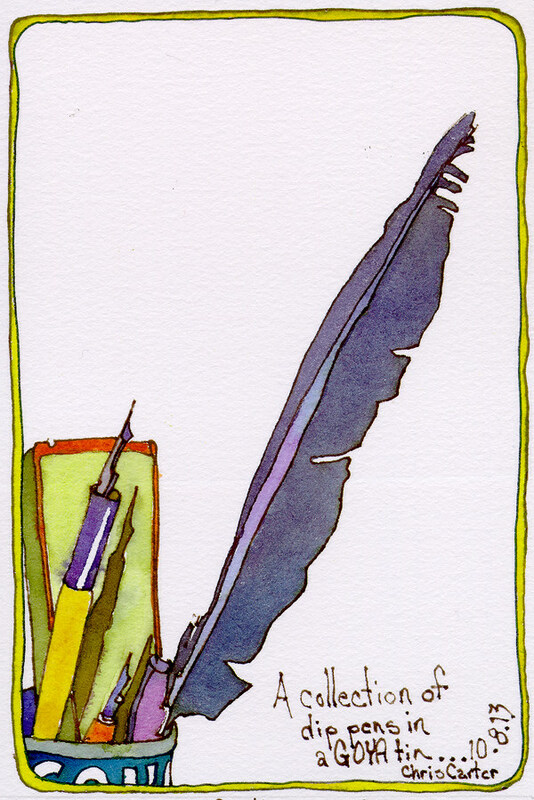 I have met fabulous artists and shared the joy of creative living and expressing life with pen and brush. My dream of being able to share the game around the world every day and in every country has now come true. An even more extensive version of the game is now available online at www.ExploreWithChrisCarter.com. Just a reminder … this blog is not the blog I currently post to on a more regular basis. I leave it online because of the wealth of information that is packed into it’s pages. If you wish to subscribe to my current blog, please visit my website www.ChrisCarterArt.com. For those of you who have started following this blog over the past two years, I want to remind you that I no longer post on this blog. I now post on my website blog. I have kept The Creative Color Blog online because it still has a great deal of information on it that I haven’t had a chance to transfer over. Please visit my current blog and subscribe to the blog and/or the monthly newsletter. As you have noticed, I’m not posting very often on this blog anymore. My schedule and my focus have shifted. I’m spending more time traveling, teaching and painting in the studio. Please remember that most of my blog posting will be done on my website blog rather than here or on my Third Time Around Blog. Please subscribe to the website blog and/or the monthly newsletter if you want to continue to follow my adventures and musings. Link to Website Blog …… Thanks! 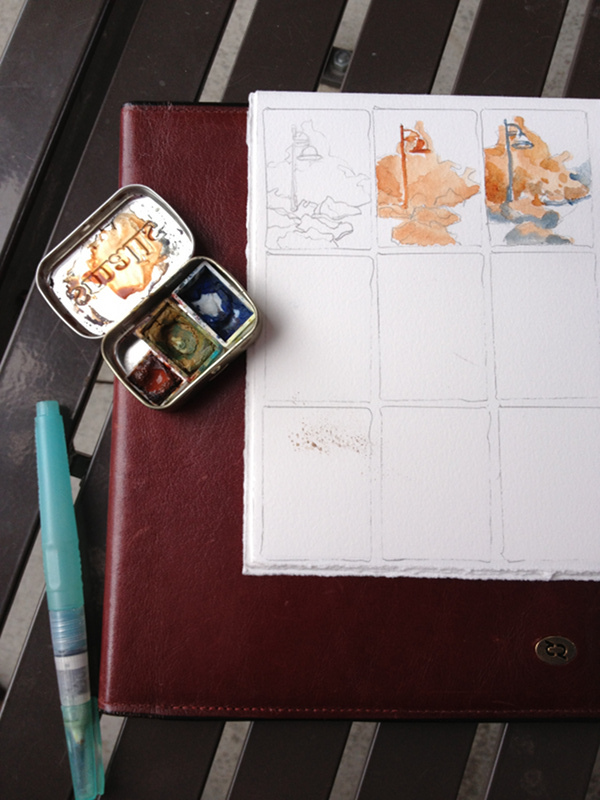 Image: Dip Pens in Goya Tin, drawn first in ink with fountain pen, followed by watercolor washes, Color Scheme- Analogous with Split Complements. A new way to explore when traveling…. or even at home…. Nine Squared Walk’n’Draw! It was time for me to make up a new game to play. I’m now working on Design and Temperature. In Susan Abbott’s workshop earlier this year, she emphasized the order of priorities when painting….. First comes Shapes, then Values, then Temperature and lastly, Color. With that in mind, I used the concept of my video “Twenty Steps” to create the new game I’ve titled Nine Squared. 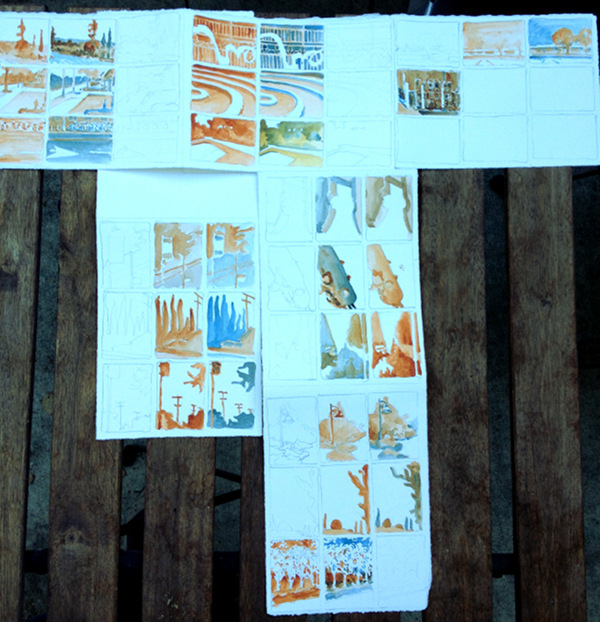 Before the walk, I drew a grid of nine rectangles on nine sheets of watercolor paper. All I needed to bring with me were the sheets of paper, a mechanical pencil, a waterbrush, a mini Altoid tin with warm and cool pigment (I only needed two pans, not all three that are shown above) and my leather folder that I use as an easy-to-hold drawing surface that doubles as a folder to carry the paper. I begin the walk, taking Nine times Nine steps in any direction (Eighty one steps). I stop, choose a composition, snap a photo and start my timer for nine minutes. In those nine minutes I determine my shapes and repeat them in two more rectangles. I leave one as the pencil drawing, paint the second as a value sketch in browns and the third as a temperature sketch in warm and cool pigment. Like any of my games, I allow myself to break the rules on a regular basis. I do not stop in the middle of a busy street just because I’ve reach step number eighty-one. If there is a nice place to sit in the shade and I reach it at step seventy-three, I stop and sit down. If I need twelve more steps to get to a nice shady spot, I take those extra steps. The rules are simply a guide to force me to be more observant of every spot I pass through and to determine warms and cools to create stronger design. On September 26th and 27th I’ll be teaching another Color Scheme Game/Color Value Workshops at RileyStreet Art Supply in Santa Rosa. On September 28th and 29th I’ll teach Watercolor Techniques at the art story. Online registration is open on my website: ChrisCarterArt.com. I’m looking forward to spending time with new students and traveling a bit with former students who will be sharing some of their favorite en plein air painting spots with me. I’ll do my best to post a few of our color adventures while I’m away. Image: Orbs No. 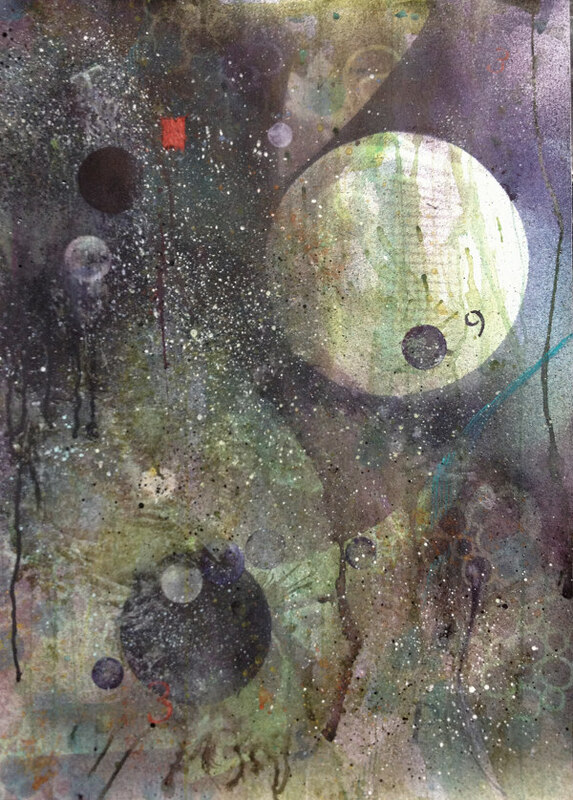 20 , watercolor, 12″ x 18″, created using flea market trash as templates applying paint with a mouth atomizer. Color Scheme: Extended Analogous. A fabulous solution for framing large watercolors! Thanks to my friend Joanie Springer (artforthesoulofit.com), I will have at least a dozen extra large watercolors hanging in the upcoming solo exhibit of Healing Art at Overlook Hospital in November. Joanie works in gouache. Her paintings look like oil paintings, especially because she waxes them rather than matting them and framing them under glass. I am at the point where I want to spend my time and energy painting rather than cutting mats, glass and plexi for the larger works for exhibits. In addition, I would rather spend my money on traveling than on mat board, glass and plexi. the solution? Dorland’s cold wax! Everyone loves it. No reflection! 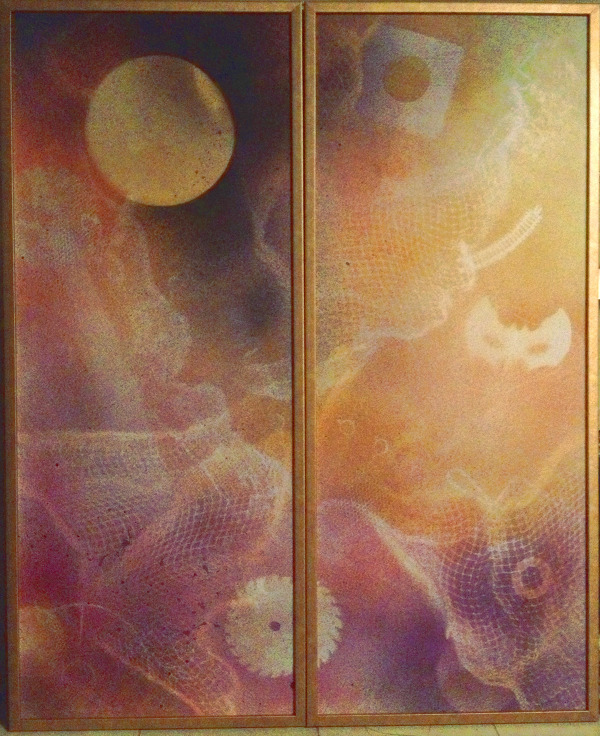 Beautiful finish as well as protection….. and light weight for hanging. What could be better? thank you Joanie! 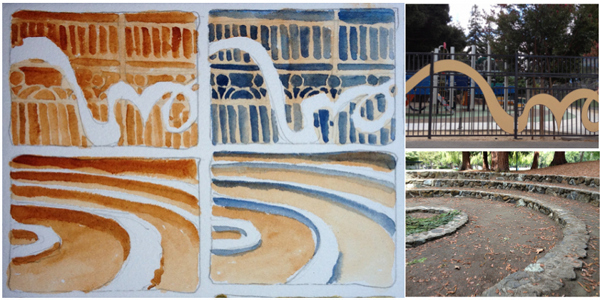 Granted, there is only one tiny piece of paper glued onto the watercolor paper, but….. that still makes it a collage. I’m not a purest when it comes to painting. When the painting begins to take on a personality, I nurture that personality, mood, story, whatever it might be evolving into, with anything and everything I can to make it the most that it can be. In this case, the painting needed a tiny rectangle of red paper (1″ x 1.5″). The final touch was the dark orb next to the piece of red paper. Before adding those two elements, the depth of the painting was remarkably shallow. Those two elements, one because of the color contrast and the other because of the value contrast, created the illusion of extreme, infinite space. It helped to view a black and white version of the painting as it neared completion. I make a habit of viewing my paintings in black and white to avoid guessing at design problems that might be resolved with only one or two strokes. 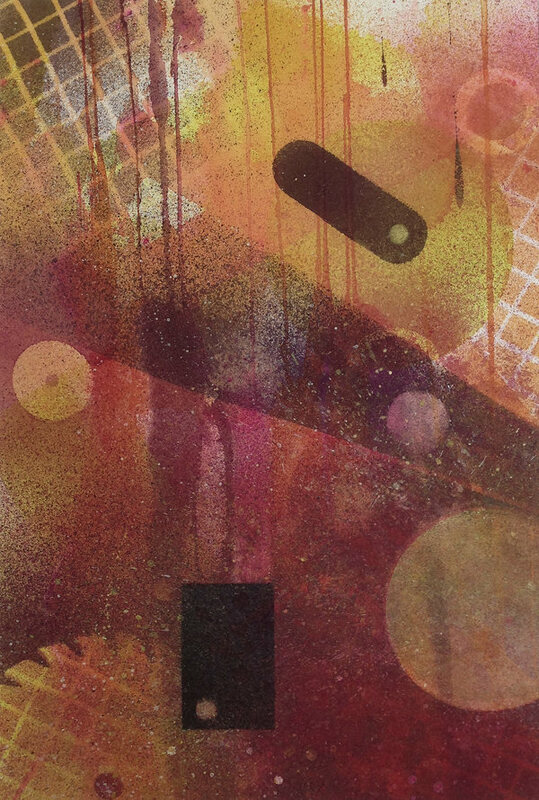 I used a combination of brush, splatter, junk templates, mouth atomizer, saran wrap, collage, scrape and comb. Orbs. No. 22 – Watercolor and paper, 22″ x 30″, to be included in the Healing Arts exhibit at Overlook Hospital in November.